Please select a size. EU 36 - In StockEU 37 - In StockEU 38 - In StockEU 39 - In StockEU 40 - Low Stock Please select a size. Styling up a classic heeled court, Public Desire drop the Drank profile just in time for a night on the tiles. The man-made upper boasts chic perspex vibes while bronze accents on the footbed give a glam edge. 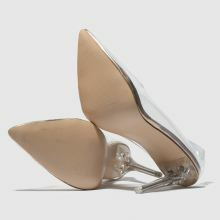 An 11cm heel finishes things off.